High-strength mesh and solid covers can be custom designed to precisely fit any size or shape water tank, and will meet any specialized requirements at your facility. High-quality products built to outlast and outperform the rest! 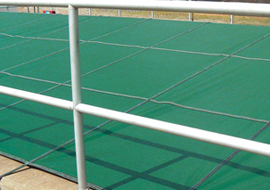 Choose LOOP-LOC for high-quality industrial covers and tarps that stand up to the elements and stand the test of time! Our company has been known for the strength, durability and workmanship of our products for over 30 years. Stop wasting money on cut-rate inferior poly products that don't last. © 2011 Loop Loc Inc.